Jonathan Apgar was born in San Diego, California in 1977 and currently lives in Los Angeles, California. He received an MFA in Painting and Drawing at the University of California Los Angeles in 2013. He received a BFA from California State University Long Beach in 2009. He had solo exhibitions at ACME in 2013 and Dread Lounge in 2018. 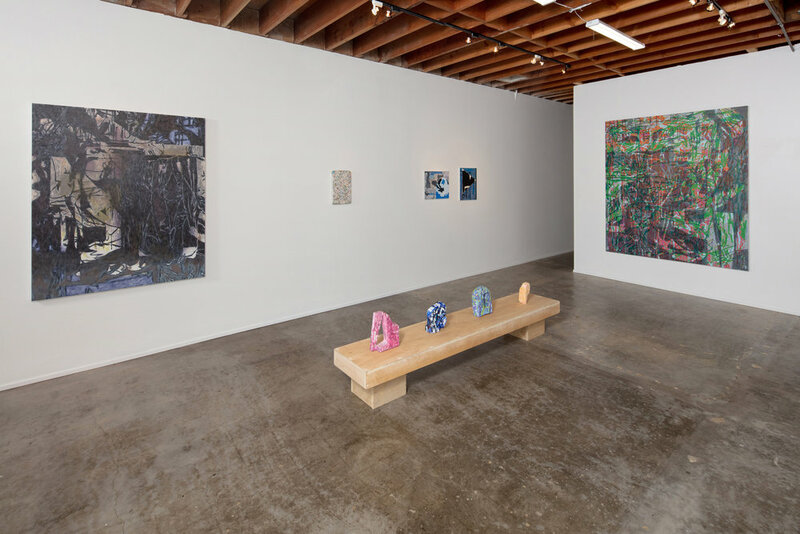 His work has been included in group exhibitions at 356 S. Mission, Los Angeles, CA (2016); PLUG projects, Kansas City, MO (2016); HilgerBROTKunsthalle, Vienna, Austria (2015); PØST, Los Angeles, CA (2014); TSA LA, Los Angeles CA (2014); The Underground Museum, Los Angeles, CA (2014); Torrance Art Museum, Torrance, CA (2012); George Lawson Gallery, Culver City, CA (2012). Leslie Baum makes painting-based installations that are invitational and deeply informed by her twenty plus years as a museum educator at the Art Institute of Chicago. Baum received her BA from the University of Vermont and studied abroad at the Glasgow School of Art. 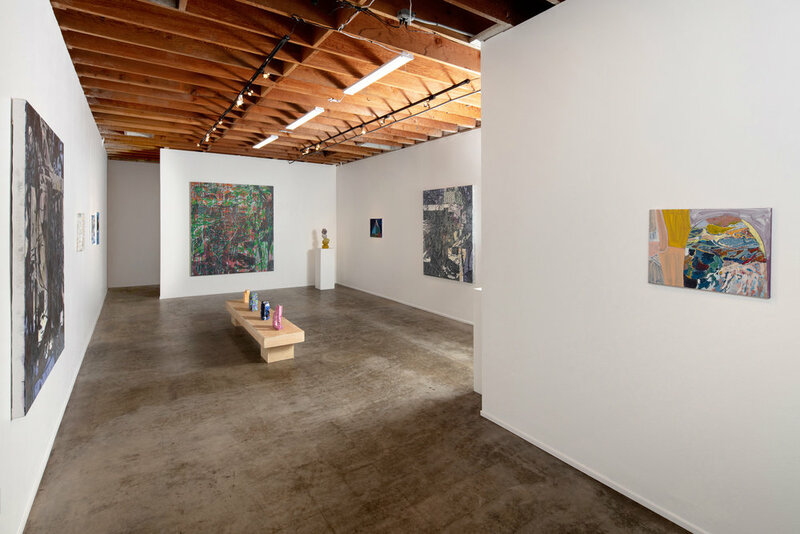 Since 1993, Baum has exhibited in venues nationally and internationally including exhibitions in New York, San Francisco, Portland, Mexico City, Rome, and South Korea. Her drawings and paintings are in permanent collections of the Chicago Art institute and the Elmhurst Art Museum. Her work has been reviewed extensively including in Artforum, Art in America, Hyperallergic, and the Chicago Tribune. She has received residencies at Yaddo and the Vermont Studio Center. Leslie Baum lives and works in Chicago. Rema Ghuloum currently lives and works in Los Angeles, CA. She received her BFA in Drawing and Painting from California State University, Long Beach in 2007 and her MFA from California College of the Arts in San Francisco in 2010. 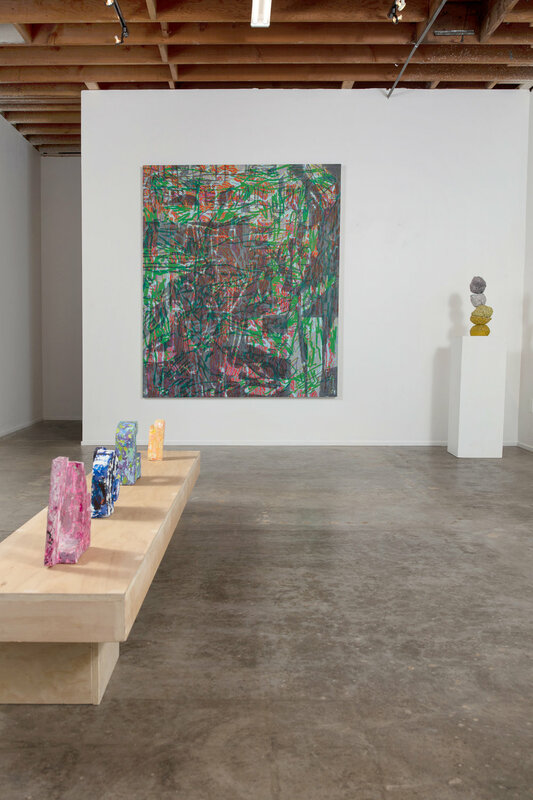 Rema was a recipient of the Pollock- Krasner Foundation Grant in 2018, the Esalen Pacifica Prize in 2012, the Joan Mitchell Foundation Grant in 2010, the Max Gatov award in 2007, and was an artist in residence at the Joan Mitchell Center in New Orleans in 2018. Rema has exhibited nationally and internationally at venues like Edward Cella Art + Architecture, the Cue Foundation, UCLA's New Wight Gallery, Sonce Alexander Gallery, George Lawson Gallery, UC Berkeley's Worth Ryder Gallery, Torrance Art Museum, and Arka Gallery in Vladivostok, Russia. Scott Wolniak is a conceptually-based multidisciplinary artist living in Chicago. His work in drawing, painting, sculpture and video involves humor, everyday life and new age themes through labor-intensive and experimental processes with humble materials. Wolniak has exhibited extensively and is represented in several museum collections, including the Art Institute of Chicago, the Museum of Contemporary Art, Chicago, and the Lynden Sculpture Garden. He received a BFA from the School of the Art Institute of Chicago in 1995 and MFA from the University of Illinois at Chicago in 2002. Wolniak teaches in the Department of Visual Arts at the University of Chicago.